Growing Little Ones : Dinotrux Toy Review! Garby Eating Rocks and Pull Back Racer Ton Ton! Dinotrux Toy Review! Garby Eating Rocks and Pull Back Racer Ton Ton! 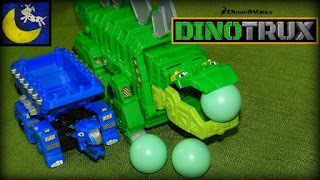 More Dinotrux toys! In this video I show you Garby and Ton Ton! Garby has 3 rocks (balls) that comes with him that he eats and then shoots out his backside just like in the episodes! He also has fun phrases from the show and tummy aching sound effects. Poor Garby is always eating rocks and always having tummy issues. In episode 6 he even accidentally eats Revvit! The Ton Ton toy is a pull back racer and as long as he is on a smooth hard surface he is pretty fast! His head and dump truck back move as he races along. I hope you enjoy this video! The Mega Chompin Ty Rux will be posting to YouTube tomorrow morning! Thanks Guys!